Rummaging through a file from the late Bernard Holland's collection, full of Market Drayton information, Mark came across this picture of a 17" Coal Engine, on a mixed freight train. There even seem to be some empty cattle wagons in it. 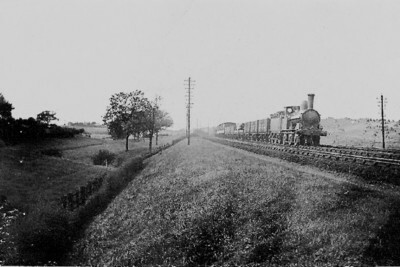 The photo's inclusion in the file suggests that it was taken in the Market Drayton area, or on the GWR Wellington to Nantwich line, or maybe on the Nantwich to Crewe line. There are three tracks on the line, not two, and the telegraph poles are distinctive and appear on both sides of the line. Is anyone able to pinpoint where it was taken? It would perhaps be unlikely to find an LNWR 0-6-0 on the GWR line, or the NSR line to Market Drayton, but it might have been possible after the grouping. More unlikely perhaps, and earlier, could it be one of the batch of LNWR 0-6-0s purchased by the NSR? The print is a tiny sepia one, very old, measuring only 3.5in by 2.5in, so this is the best scan that can be obtained. The line looks like the recently electrified Crewe to Kidsgrove section after leaving Alsager and having crossed the A5011. The view is looking south. Although the image (understandably) isn't very clear, the safety valves look like 'pop' valves - suggesting the LMS period. The photo looks older than that, but maybe this is only because the photographer was using orthochromatic film. There seem to be three lamps on the buffer beam: does anyone know what such a headcode might signify? The suggestion that the engine might be one of those sold to the North Staffs can be ruled out. The engines sold (four, in 1900) were all DX Goods. There appear to be three sets of tracks in view. If that is the case it could be on the Trent Valley route travelling south approaching Rugby somewhere in the vicinity of Newbold troughs.